Inspired by: My Armenian “sister” Michelle Babayan, who is a phenomenal personal chef and caterer. 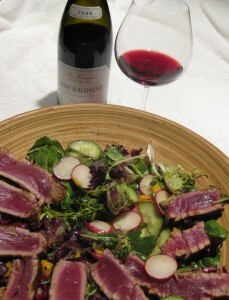 Michelle’s Ahi (Yellowfin Tuna) salad with a creamy wasabi dressing is to die for, and the 18 spice blend she uses to coat the Ahi before searing is amazing with fabulous flavors to bring out the flavors of the fish without being spicy hot and overwhelming the fish. I love her spice blend on the Ahi and have now found that I love mine too! When I use mine, I use it more like a rub – because it’s much spicier than hers. I like it to add beautiful flavor, but not overwhelm the fish. What’s interesting is that when I use my blend, I find that it tastes a lot different than when I use it in other dishes. It’s very chameleon-like! I really love both spices with this salad. This is one of my favorite meals. Mix all of the dressing ingredients in a shaker. Put the salad ingredients in a large bowl. Rub olive oil on the Ahi and coat it with the 18 spice blend, or give it a good rub with my spice blend. Heat a skillet to sear the fish (a cast iron skillet is best as it gets very hot) – add a tablespoon of olive oil, and then sear just a couple of minutes on each side – it should get crispy on the outside but not cooked through. Slice the Ahi quickly so it doesn’t continue to cook – 1/4 to 1/8 inch slices. Toss the salad with the dressing (but reserve a bit of it). Lay the Ahi over the salad and then drizzle it some dressing over it. Notes: I also love charred red pepper in the salad – especially when I want a warmer salad. You can cook that on one side of the skillet and the fish on the other – but start it about 5 minutes before the fish. Spread that over the top of the salad along with the Ahi. Wine Suggestions: My favorite with this salad is a California Pinot Noir or a Red Burgundy. I’ve also had it with a light Chinon that was really yummy. I’ve also found that when using my spice blend, it’s really nice with a slightly bigger red such as a Grenache/Syrah or a Rioja. Inspired by: I love salad. I love pan fried or grilled shrimp. I love spice! This just happened one night and is something we now make fairly often. It’s not a recipe that needs documenting, other than having it here it helps me think of something to make when my brain has turned off for the day! I don’t keep a lot of extra food in the house, but salad stuff and a bag of shrimp in the freezer are the most common to have around. This one is using my super fast and easy spicy pan fried shrimp recipe, but I love this with spicy grilled shrimp as well. Put your salad ingredients into a large bowl and toss with 1-2 tablespoons of olive oil and the lime juice. Then add a bit of the spice (to your liking) and toss again. Heat 1 tablespoon of olive oil in a cast iron skillet or sauté pan and add the shrimp. Sprinkle with the spice (any amount to your liking – a small amount goes a pretty long way) and cook for about 2 minutes on each side. If you are including red bell peppers or other vegetables that you like cooked or hot – you can add them to the skillet as well. You might even want to start cooking them about 8-10 minutes before the shrimp if you like them charred (my favorite). 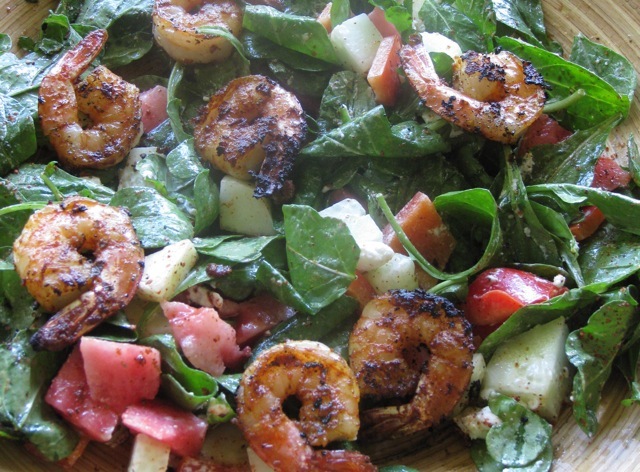 Top the salad with your pan fried shrimp and vegetables and serve. Wine Suggestions: I love not having vinegar in salads – it is always more wine-friendly. This salad is fabulous with anything from a light red to a spicy or medium-bodied red. Our favorites are California Pinot Noir (especially if we add the papaya or mango because California wines tend to have much riper fruit than a Red Burgundy from France and will pair better with the sweeter flavors), or a Grenache-based blend from Southern Rhone or Spain, or even Bordeaux blend with a good portion of Merlot so that it is soft and not too tannic. If you prefer white, try a slightly off-dry white such as a Condrieu or Riesling or Chenin Blanc. Serves: 4 – just the two of us had this tonight with fresh whole grain bread and roasted brussel sprouts. We could have easily had two more people join us – we ate way too much and we’ll still have awesome leftovers for tomorrow. Inspired by: It’s the end of December and for the past couple of weeks, I’ve been seeing Dungeness crab at the fish counter. I’ve been thinking that I must get some of these before the season is over! I LOVE crab and it brings with it a lot of memories for me – mainly related to my dad. I remember as a child going out for crab with my family, and my brother and I would leave the restaurants still playing with the claws. I also think of my dad ordering crab cioppino at restaurants and wearing a bib because it was so messy. 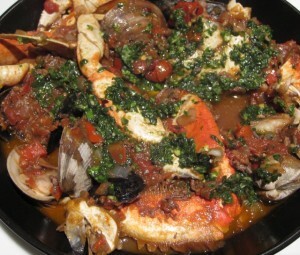 When I started thinking about what I wanted to have for dinner tonight, crab and tomatoes came to mind… and that got me googling crab cioppino recipes. The first one I found was “Judith’s Dungeness Crab Cioppino Recipe” from Food and Wine (Judith was chef Michael Mina’s late mother-in-law who apparently used to make it for Christmas Eve dinner). It looked great and easy, but I had to make a few modifications based on ingredient availability and the fact that I was cooking for 2, but it turned out so amazing, I’ll do it exactly the same way next time! This recipe makes a very thick soup with a LOT of kick! Yum. In a large soup pot, sauté the onion for about 2 minutes on high heat. Add the red bell pepper and sauté for about 2 more minutes. Add the minced garlic and jalapeno and sauté for another 6 minutes or until it is all very soft and beginning to brown. Add the tomato paste, stir well, and cook for another minute. Add the tomatoes, wine and bay leaf and cook for another 5-10 minutes – until thickened. Add the can of clams with their broth and season with salt and pepper. Bring to a boil and cook on medium heat for about 20 minutes. Meanwhile – in a food processor – combine the basil leaves, whole garlic cloves, and red pepper flakes – chop well. Add 1/8 cup of olive oil and puree until smooth. Then prepare the crab by removing the top shells and the flap on the undersides – pry out any brownish insides and feathery lungs and discard. Rinse the crab bodies in cold water and break them up into pieces that are a few inches in length – or however you’d like to see them presented in your dish when serving. Now it’s time to add the clams, mussels and shrimp to the pot – be sure to push them into the hot broth. Once the shells of the clams and the mussels open (about 2 minutes), add the crab pieces and push into the broth as much as possible – put the lid on the pot and continue to cook for another 2-4 minutes until everything is hot. Use tongs to take out all the shellfish and distribute evenly into bowls – then scoop out broth evenly into bowls. Drizzle/spread the basil puree over the top of each and serve with fresh bread. Notes: I would have liked including some scallops, but they weren’t available. White fish, such as Halibut, would have been good too. If you like your broth thinner – replace the can of clams with 16 oz of clam broth (I wasn’t able to find it – the stores were probably sold out from Christmas, but it’s what the original recipe called for). I’m sure you could also double the diced tomatoes without losing flavor – this is a VERY flavorful and spicy dish! It can also be made ahead and refrigerated for up to 3 days. Wine Suggestions: We drank this with a 2003 La Spinetta Barbera d’ Asti Superiore. It needed some decanting, but it was a fabulous pairing with the rich tomato and spice of the dish. 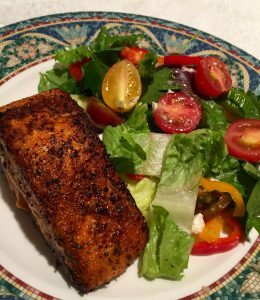 Inspired by: I can’t even remember the first time I had blackened fish, but it was one of the first ways that I enjoyed fish. This is so fast and easy and I love how crispy the outside of the fish gets, yet stays so moist inside. I also think this seasoning really enhances the flavors of salmon. Heat your cast iron skillet so that it is searing hot (approximately 7 minutes over a gas stove). Make sure you have a powerful hood/fan or you might set off your smoke alarms and get a visit by the fire department! Coat the fish lightly in olive oil and sprinkle on the spice. Add olive oil to the hot skillet, let it heat up for about 30 seconds, and then place the salmon in the skillet. Sear each side for 3-5 minutes until blackened, crisp and just barely cooked through. Alternatively, if you’d like a crispy exterior but not so black, the skin side and the top for about 2 minutes and then finish off in a 350 degree oven – approximately 10-12 more minutes. For thiner cuts or wild salmon that is lean, cut baking time to 6-8 minutes. Wine Suggestions: A medium bodied red with some good fruit and a bit of spice on it would be perfect. 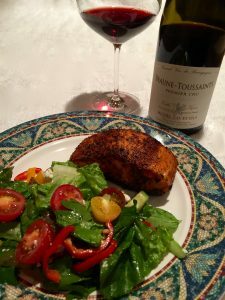 I’d recommend the same wines as suggested with the blackened chicken and because some salmon can be pretty fatty, I think that can also hold up well to some Bordeaux blends or other bigger reds that have softened with some age. Inspired by: The mother-in-law of one of my closest friends, Judy Sellers. Judy is food and wine savvy as well as being incredibly adventurous, fun and interesting – someone I’m thrilled to know. One thanksgiving when we hosted dinner, she and her husband joined us and brought this as an appetizer. Everyone loved it and I still make it for parties because it’s so yummy. That was my first introduction to Hugh Carpenter and this recipe is from his “Fast Appetizer” cookbook. After that a few of us girls took a “How to Cook Fish” class with him that was really well done. Fill a bowl with water and some ice to make very cold. Boil water in a large pot and cook shrimp about 1.5 to 2 minutes – until done but don’t overcook. Drain shrimp in colander and add to bowl with ice water so they don’t continue cooking. When it’s cooled down, drain again. Mix the basil Ponzu sauce ingredients together in a shallow glass bowl (this can be made up to 10 hours before serving). When ready to serve, toss the shrimp with the sauce – can serve with toothpicks as “finger” food. Notes: I purchased Hugh’s cookbook so this is the original recipe, but I recommend doubling or tripling the Ponzu Sauce ingredients so it covers the shrimp a bit better, or if you wanted to put some on the side for dipping. The shrimp taste best when they are freshly covered or dipped in the sauce. Wine Suggestions: Because there is a slight sweetness and spiciness to this sauce, a slightly off-dry wine such as a Riesling is a nice pairing. Depending on what chili you use, if the sweetness and spiciness is only slight, the ginger and other aromatics make it a nice pairing with dry, aromatic whites such as a dry Riesling, Gruner Veltliner or Torrontes.